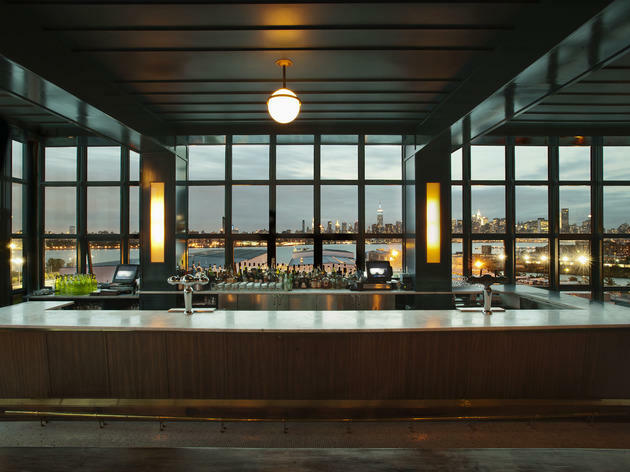 This outdoor terrace bar on the Wythe Hotel’s sixth floor affords sweeping views of the East River and Manhattan, and it’s an ideal vantage point for watching summer sunsets while lingering over a pint of Radeberger or a quaff made from local small-batch spirits. Sure, the crowd comprises mostly globe-trotting cool kids from outside the five boroughs, but consider that another avenue to finding a guilt-free summer fling. 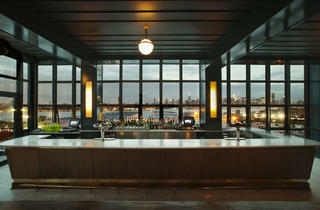 This rooftop features a very cool setup offering views of the East River as well as Brooklyn and whole the NYC skyline. The bartender kindly suggested a cocktail based on the preferences I shared with her; even though I was disappointed due to the high alcohol content of my drink and went ahead into enjoying the very amazing views the rooftop deck offers. The crowd was mostly young and very stylish even though it was an early Saturday afternoon. I loved my short stay in the midst of my drink disappointment... Would definitely give them another try! Fancy backdrop atop a chic hotel in Brooklyn--here's a neighborhood gem worth making a trip or two!